ClickOnce is a great technology that simplifies the setup and install process for the end user. 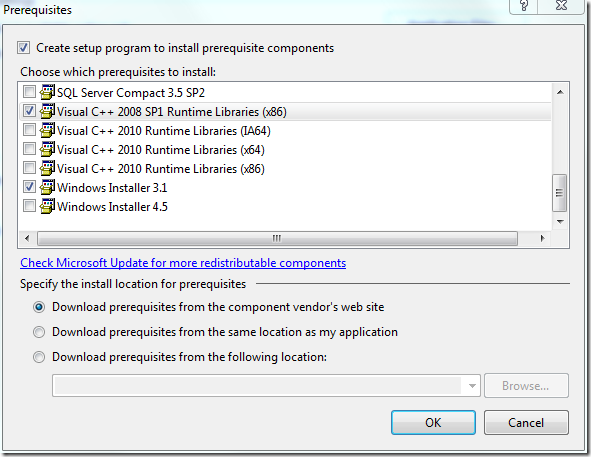 I ended up in a project where there was a need to install the latest SQL Server Compact Edition 4.0 in private distribution mode in a .NET v4 solution. In theory, that’s just the case of distributing the SQL CE runtime DLL’s to the destination folder. But wait, there’s a catch. The latest SQL CE v4.0 is dependent on the Microsoft Visual C++ 2008 Service Pack 1 Redistributable Package ATL Security Update. 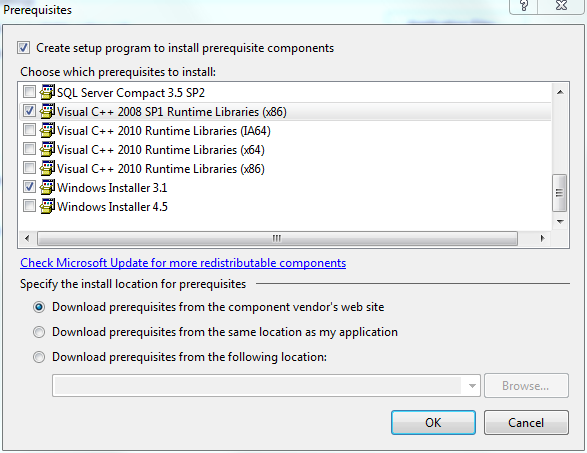 (msvcr90.dll version 9.0.30729.4148) Well, that shouldn’t be a problem, just open up the prerequisites dialog in VS 2010 and put a check mark into….. oh darn. 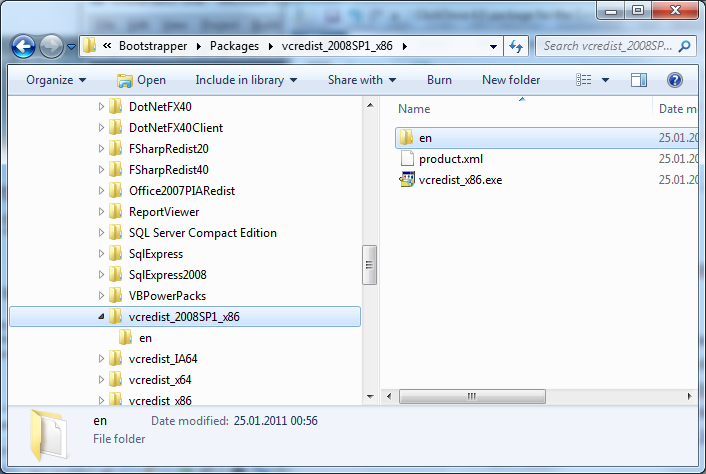 There is no bootstrapper package for the 2008 VC++ Redist in Visual Studio 2010, just the newest 2010 VC++ redist package. Well, just create you own bootstrapper package, and here I will guide you through the steps. 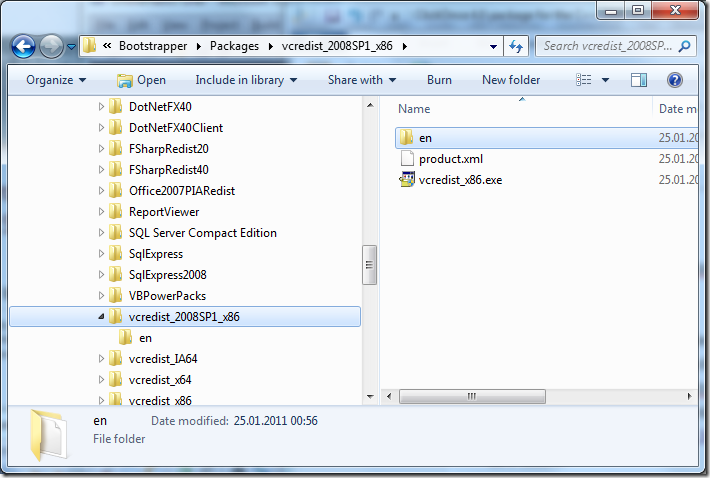 First, create a new folder in the package install location for the bootstrapper. The default location is C:\Program Files (x86)\Microsoft SDKs\Windows\v7.0A\Bootstrapper\Packages. Create a folder named vcredist_2008SP1_x86. Download the Microsoft Visual C++ 2008 Service Pack 1 Redistributable Package ATL Security Update and save the vcredist_x86.exe into this new folder. And when the end user runs the ClickOnce setup, it will automatically install the VC++ redist if it’s not installed already.